Svenja Herrmann was born 1973 in Frankfurt and lives in Zürich. She studied German and Legal History and has been shortly granted a literary residence for 2015 in London given by the foundation Landis & Gyr, Switzerland. Her works have been awarded several literary prizes. Several of her texts have been translated into English, Polish, Ukrainian, French and Rumanian. 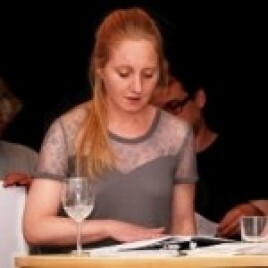 Svenja Herrmann has been invited to many literary events and her poems have been anthologized in several international poem collections. Previous publications includes a audio-book of poetry and electronic music. Beside her literary work she runs a programm for literary education for gifted children and also her own company (www.schreibstrom.ch) which offers mentoring programms for gifted children with special needs and workshops in creative writing. She was interim director of a literature house in Switzerland and also organized readings and poetry panel discussions on the topic public and poetry. She edited a school reading book and a literary anthology about human rights.Picture: Hellmuth Lang On 23rd October Svenja Herrmann will take part in discusion about East- Central Europe poetry.